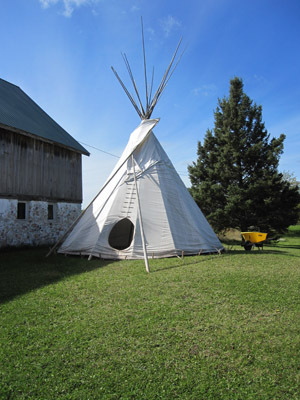 Our tipi was erected once again this year at our neighbor’s home to allow a place for a visitor to stay. 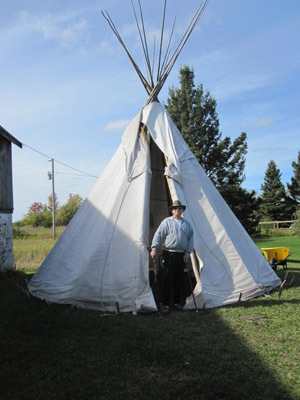 This man is very allergic to cats and thought it would be neat to sleep in a real tipi during his 1 week stay there. Today’s weather conditions were warm, sunny, and calm winds, so Franco and I walked up there mid-afternoon and began the deconstruction project. Some of the work had already been done when we got there, notably the interior fly had been taken down and folded up. Notice also the smoke flaps are closed. 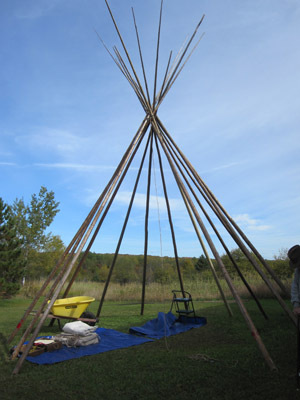 Their guest decided not to light a fire while he was there, so the flaps were closed to keep the rain and wind out. Inside the tipi before we started to take it apart, Bob, Franco, and I enjoyed this wonderful space for a few more minutes. Franco’s idea of enjoying the space involved coercing Bob to throw his stick for him. Using a two step kitchen ladder, I unpegged all the button holes on the cover. Next I pulled out the numerous wooden stakes around the perimeter of the cover. 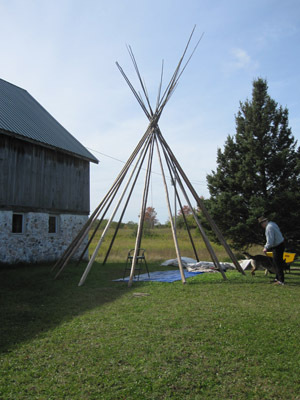 Once that was completed, the cover was flapping in the breeze while still securely tied near the top of the lifting pole. 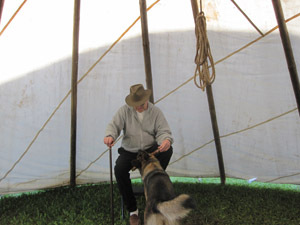 I gathered the cover in my arms about chest height, and wrapped a bungee cord (of course it was an authentic native american bungee cord) around it so it wouldn’t fall off the lifting pole as I lowered the whole thing to the ground. The cover was then untied from the lifting pole, spread out on the grass, and folded up. All that now remained was to remove the poles in the reverse order they were installed, and lay them carefully on the ground. In this picture, several of the poles were removed. Once all but the three original tripod poles were put away, I lowered the tripod, untied the knot, and we were essentially done. I was struck once again at the brilliance of this design. It makes a roomy snug shelter, and one that can be erected and struck without too much trouble. Today I also spent some time on the sawmill making lumber for the Estivant Pines project, and various other household chores. It was good to be outside and enjoy the Canada Geese and Sandhill Cranes moving to and fro while having their important discussions. This entry was posted on Wednesday, September 22nd, 2010 at 9:41 pm and is filed under Uncategorized. You can follow any responses to this entry through the RSS 2.0 feed. You can leave a response, or trackback from your own site.